Harping on about ice cream! Last week's column <click here> covered the intricacies of basic ice cream making. This week we take what we have learnt and progress, we are going to take the basics and give them a little bit of a twist. Once you have an ice cream machine, if you are like me you want to just make more and more. You will want to take things to new heights and try something different. This week's two recipes do just that. To serve ice creams in a neat quenelle (rugby ball shape) take a dessert or kitchen spoon (with a pointed end) and dip into warm water. Drag this atop the ice cream applying light pressure. This should 'scoop' the ice cream up into a wonderful quenelle shape. Turn on your ice cream machine ahead of time, before you start any other preparation, so it is chilled ready to go when you need it or remember to put your bowl in the freezer the night before (depends on your ice cream machine). Both of these ice creams are of the easy to make raw variety. As the egg is not cooked great care must be taken to ensure the eggs are as fresh as possible and prepared with the highest hygiene standards. I suggest they are made and eaten within 3 hours. If you place the ice cream into the freezer and it hardens too much, remove from the freezer 20 minutes before use and allow it to soften before use. If you are a little wary of making ice cream without first cooking the eggs, then simply use the above recipe ingredients but replace the method with the cooked version I shared with you last week. 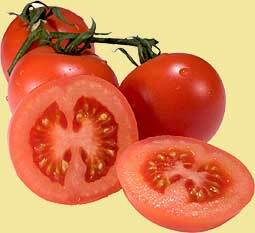 Unusual to say the least, well on first impression any way , , , but after all tomato is just another fruit! Enjoy your Tomato Ice Cream and bon appetit . . . . .